A lack of education has now been linked to having a shorter life expectancy. 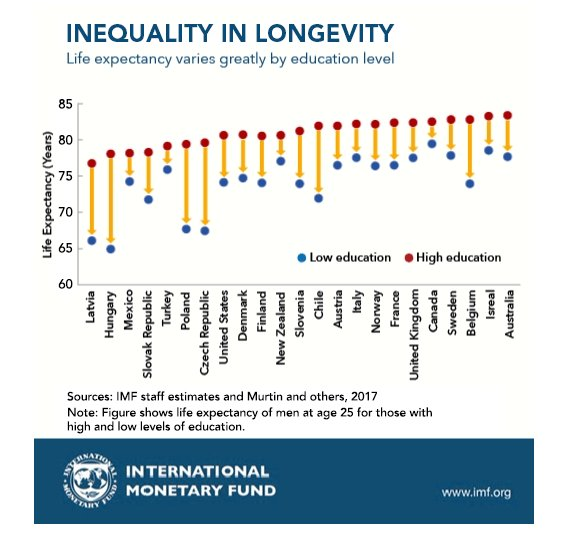 Poverty and low education levels are directly correlated to life expectancy around the world, according to a new International Monetary Fund blog that emphasizes access to quality healthcare as another key variable. Men with a lower level of education live shorter lives on average than their better educated counterparts domestically. The gap ranges from four years in Italy, to 14 years in Hungary, the IMF said. The Fund’s review included a wide cross section of rich and middle-income nations. “These health gaps represent a huge loss for people and the countries where they live,” the IMF said. The Fund recommends greater standardization of healthcare provision not just across incomes but geographies, for instance, in less-developed or rural areas.